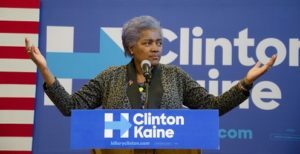 My colleague Becket Adams was right on target in saying that it was “shrewd” for Fox News to hire former Democratic National Committee Chairwoman Donna Brazile as a regular analyst. And she’s wise to take the job, even if her best efforts still will not likely change any minds among Fox viewers. Allow, please, a personal anecdote. Late in the NFL season of 2009-10, the one that would crown the New Orleans Saints as Super Bowl champions, the Saints played the Redskins on an icy day at the D.C. area’s FedEx Field. A group of Louisiana expatriates had all gotten the word to congregate at a particular tailgate party outside the stadium.